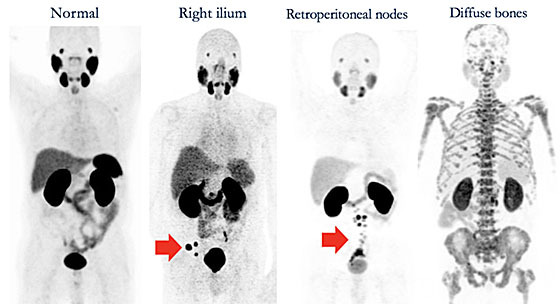 Prostate specific membrane antigen or “PSMA” imaging is a nuclear medicine exam using positron emission tomography (PET) to detect prostate cancer. This scan is investigational and has not yet been approved by the US food and drug administration. PSMA PET is very sensitive for detecting prostate cancer, with accumulating evidence suggesting it is superior to conventional imaging tests such as CT scans or bone scans. There are several agents currently being studied at academic institutions including those labeled with 68Ga and others with 18F. Currently, the PSMA PET scan is being studied in two patient populations. The first is patients with new diagnosis of high risk prostate cancer. These patients are at high risk for metastases which would not be found on conventional imaging, and the PSMA PET could therefore change the surgical or oncologic treatment plan. The second setting is patients with biochemical recurrence, where the prostate specific antigen (PSA) levels are rising after definitive therapy with surgery or radiation. In this case, the PSMA scan can help find sites of recurrent or metastatic disease which could be treated with a targeted therapy such as surgery or radiation instead of systemic therapy. While early trials have shown promising results, further studies are needed to confirm long term improvement in outcomes as a result of this test. Figure 1. Examples of normal (left) and abnormal 68Ga-PSMA-11 scans. Sites of metastatic disease are indicated in the heading and with arrows. Information from pioneers in in the field, Dr. Baum and his team in Bad Berka, Germany.